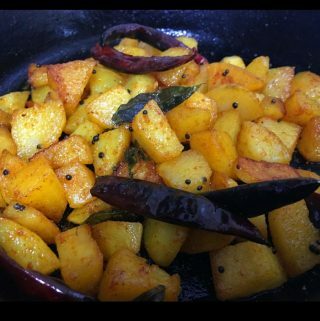 Potato mezhukkupuratti recipe is South Indian Kerala style stir fried potatoes in spices. Potato mezhukkukkupuratti or Kerala style potato stir fry tastes the best when it is made spicy, which I explains here, but you can also adjust the spices and reduce the spiciness if you wish. This is an easy to prepare vegetarian/vegan side dish for rice. 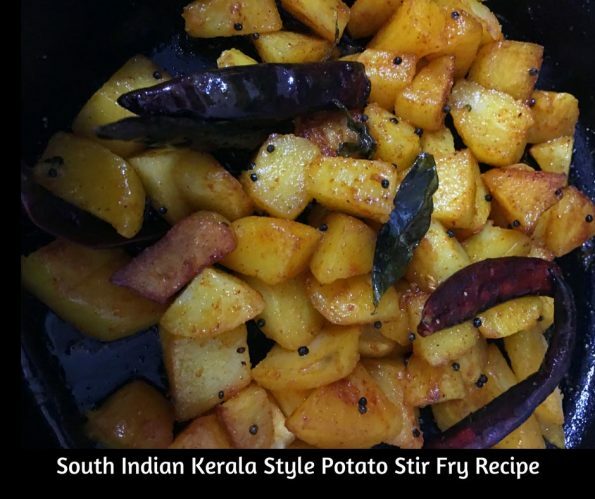 The best Kerala style stir fried potatoes is spicy, slightly crisp outside and somewhat soft inside which is very delicious and makes a very yummy and easy to prepare side dish which can be enjoyed with rice for lunch or dinner. You can serve this potato stir fry with rice along with this simple moru curry or pulissery or sambar for a simple and easy vegetarian Kerala style lunch or dinner. You can also find here another simple, easy and delicious recipe for dry potato masala flavored different spices. Though we use dry red chilies in the recipe to prepare the seasoning, what really adds spiciness to the dish is the use of red chili powder, which adds color and flavor to this potato stir fry. As the color and flavor of this dish really comes from the red chili powder, I really do not recommend avoiding the red chili powder in this recipe. However you can reduce the spiciness by using mild red chili powder instead of using hot chili powders (red chili powder is available as mild, medium, hot and extra hot). By using mild red chili powder, you can still enjoy the color and flavor of the dish while reducing the spiciness. However, if you love spicy food, you can also go for extra hot red chili powder! You can use coconut oil for the most authentic taste, as Kerala dishes are mostly prepared using coconut oil. Kerala style potato mezhukkupuratti also known as urulakkizhangu mezhukkupuratti or urulai kizhangu mezhukkupuratti or simply potato upperi (as known in South India and Kerala) is so easy to prepare and if you have potatoes at home, you can make this easy and yummy side dish for rice which can also be enjoyed separately if you wish. So here is how you can make this easy and delicious Kerala style potato stir fry following this easy potato mezhukkupuratti recipe. Potato mezhukkupuratti is a delicious South Indian Kerala style potato stir fry which is also known as potato upperi or urulai kizhangu mezhukkupuratti, which makes a simple and easy side dish with rice for lunch or dinner. Wash and peel the skin of the potatoes, chop the potatoes in small even sized cubes. Keep this aside. Heat oil in an iron skillet (or use a kadai or large pan), add mustard seeds. When the mustard seeds splutter, add red chilies, curry leaves, lightly fry for a few seconds. Add the chopped potatoes to the skillet or pan, in a single layer, add enough salt and let the potatoes get roasted in low to medium heat. After 2 to 3 minutes of lightly roasting in the skillet, cover the skillet and cook the potatoes for about 6 to 7 minutes in very low heat. If the potatoes are not soft, you may cook for another couple of minutes until the potatoes are cooked and soft. If needed, you may add a little more oil. Gently flip the potatoes and roast the other side too in medium heat for another 2 more minutes. Add the spices - garlic powder, turmeric powder and red chili powder to the potatoes and gently stir the contents, cook for another couple of minutes until the spices are all well blended with the potatoes. 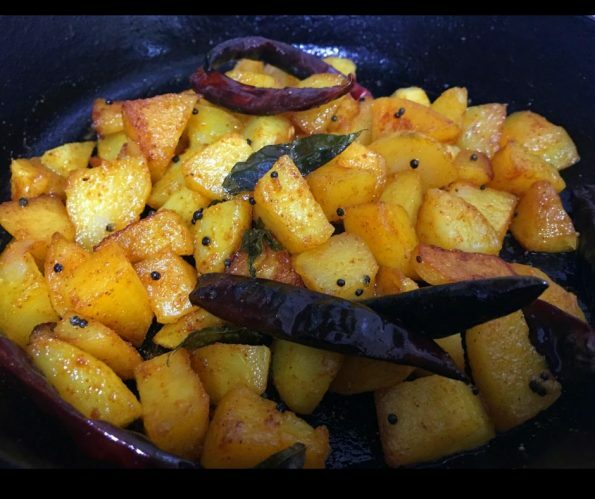 Serve the stir fried spicy potatoes hot with rice along with moru curry or sambar for lunch or dinner for a delicious South Indian Kerala style meal! 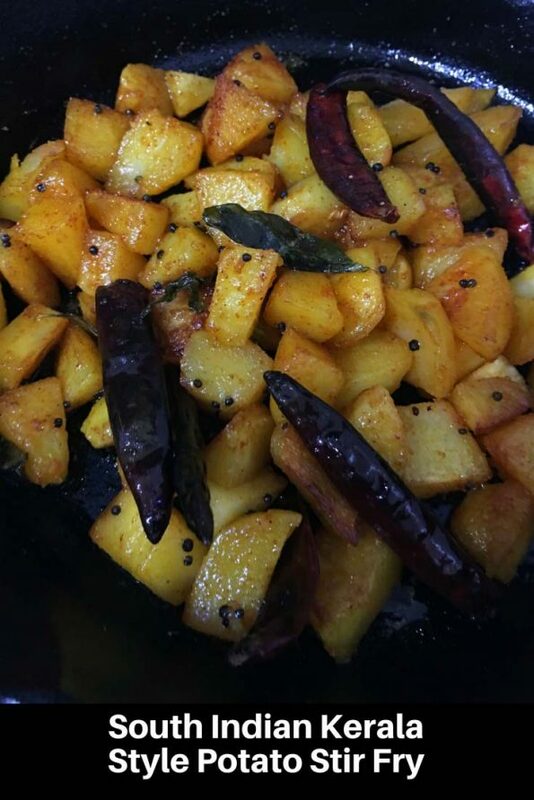 Hope you found this post on potato mezhukkupuratti or South Indian Kerala style stir fried potatoes helpful in making easy and yummy stir fried potatoes for lunch or dinnr.